The Thürey typewriter is one of these rare attempts to completely break with conventions that were already in place in 1909 and build a machine that was one of kind. And it is. It was also a commercial failure. 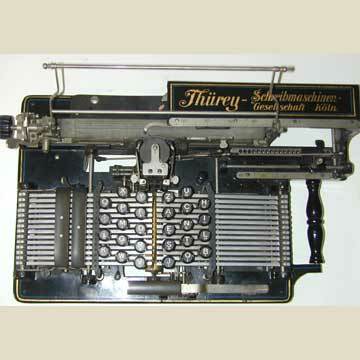 The keyboard of the Thürey consists of six vertical rows of keys attached to bars that are positioned sideways on the top of the machine. By pressing a key a typewheel is turned into position with the correct character facing forward, while a hammer swings forward from behind the paper (see pic 6). The hammer however, is not spring-driven as it is on the Hammond, but receives its momentum from the force with which a key is struck. Inking is done with two ink rolls. The machine, with a charming wooden handle on the right for lifting, is exactly twice as wide as the carriage, and one of the flattest designs around.